Associations between madness and art are as old as western culture. Aristotle identified a tendency to melancholia in the artistic temperament; Shakespeare produced multiple variations on the theme of lunatics and poets being "of imagination all compact"; and Dryden coined the notion of a "thin partition" between wit and insanity. In the Renaissance, religious agonies and ecstasies were understood to be both the source of inspiration and its subject. The contortions of bodies in Michelangelo's Last Judgment were not merely depictions of a biblical scene, but manifestations of mental strife. If El Greco's shimmering, elongated figures appear like avatars of the artist's ecstasy, viewers shudder to imagine where the fantastical hells of Hieronymus Bosch came from. The modern problem with the mad-artist principle emerged from two conflicting urges of the 19th century. The first was a desire among early romantics to view inspiration and psychic disturbance as essentially the same thing: the font of artistic motivation. The second was the less romantic urge to classify as medical conditions extremes of mental distress. Coleridge's opiate vision in Kubla Khan, of a sacred river, deep within tumultuous caverns of the mind, as creativity itself, or the pre-Raphaelites' celebration of mad Ophelia as the image of beauty, were confronted in the 1890s by Emil Kraepelin's definition of the two principal psychiatric diseases: dementia praecox (later, schizophrenia) and manic depression. Primitivism, naive art, dadaism and surrealism all invoked a realm of fantastic or unconscious disorder, but it was most particularly in expressionism that the notion of the mad artist found its modern incarnation. The pioneers of expressionism were by no means all insane, but enough of them came close enough to keep the idea alive: Van Gogh cutting off his ear and reworking the world in psychotic strokes; Edvard Munch cracking up in 1908; Max Beckmann being discharged from the army, traumatised, in 1915; Ernst Kirchner breaking down in the same year, and never really recovering. Two strands of work emerged: from artists who had themselves sipped from the cup of madness, and from psychiatric patients who had taken up the tools of art. Between 1919 and 1922, the German art historian and psychiatrist Hans Prinzhorn assembled more than 5,000 works from various mental asylums in Europe. Others had more sinister intent. In 1937, the Nazis put together an exhibition of "Degenerate Art" with the explicit aim of highlighting the shared inferior status of painters such as Paul Klee and Oskar Kokoschka with work by certified lunatics. What was later named by Jean Dubuffet as Art Brut - "spontaneous expressive outpouring from the well-springs of creativity" - survives today as the idea of "outsider art" and plays its part in that broader romantic notion many artists still cling to, however absurdly, of being outsiders. Last year, when the Whitechapel Gallery in London staged an exhibition of outsider art called Inner Worlds Outside, it set mainstream figures of 20th-century art, such as Miró, Kandinsky and Schiele, alongside work by untrained psychotics, autistics, criminals and other genuine outsiders - making no distinction between the two kinds of artist. At the start of the 20th century, there were a mere dozen or so classifications of mental disorder. By the end of the century, the official Diagnostic And Statistical Manual Of Mental Disorders had defined around 380. One objection to the idea of the insane artist is its glamorisation of what, for most psychiatric patients, is simply excruciating illness. Another is that no single entity called "madness" exists at all. More coherent - though perhaps less intoxicating - than the Whitechapel exhibition is the approach now on display at the Novas gallery in Southwark, gathered by curators from the Bethlem Royal psychiatric hospital. It is an exhibition of more than 200 works, dating from 1948 and the incorporation of mental asylums into the NHS, and includes artworks by current artists who have been through the psychiatric system. It makes no extravagant claims for a relationship between mental illness and artistic talent, starting from the simple, indisputable premise that a selection of psychiatric patients has produced art that is worthy of public attention. Historically, the Bethlem hospital and museum were home to several significant artists, perhaps most famously Richard Dadd, who in 1843 was institutionalised at the age of 26 after undergoing a psychotic fit during which he murdered his father; he remained committed until his death in 1886. Dadd was a serious painter whose work did come to take on some of the strange juxtapositions and eerie remoteness of his condition, which was probably schizophrenia. Other cases are more explicit. Until the onset of schizophrenia, Louis Wain had, at the turn of the century, been famous for his comically sentimental cat paintings. Then his cats became transfigured into blazing, insane-looking, cat-shaped abstracts. Put in a certain order, these paintings look like a dramatic chronology of the onset of an extreme psychosis. Unfortunately it is not known if Wain actually painted them in that order, or whether he may have been copying the patterns on his mother's wallpaper. 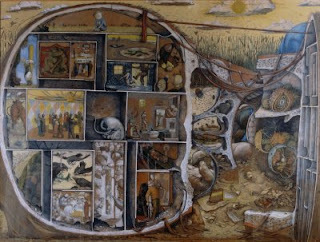 Perhaps the most extraordinary painting in the museum is The Maze, by the modern Canadian artist William Kurelek. It's a portrait of the deranged contents of the artist's multi-compartmented skull. He painted it while suffering from an acute depression, aged 26. When he got better, he gave one of his subsequent Canadian landscapes to the hospital as a demonstration of his improvement. The correlation between extremely different mental states and the scenes depicted in these two paintings is self-evident. But Kurelek's technical ability as an artist is unchanged; it is a function that was quite separate from his mental dysfunction. Michael Phillips, head of the Bethlem archives and museum, doesn't believe that talk of a thin line between creativity and insanity is one that current painters in the show particularly relish. As one said: "We don't want to be like Van Gogh; he sold only one painting in his life. We want to be like Picasso; we'd like to be successful." And some of the Bethlem artists have found international success: the Chilean potter Bibi Herrera, painter Sue Morgan, an artist who calls herself "Exaqua". Karen Risby, who founded the Bethlem's contemporary gallery, says when she first arrived she was curious about why people had the compulsion "to work, create, draw - without wanting anyone to see it. I just wondered why people do that." Research in the area, though piecemeal, reveals distinctly higher rates of psychiatric conditions - most particularly mood disorders - among artists and writers. In her 1993 study Touched With Fire: Manic-Depressive Illness And The Artistic Temperament, Kay Redfield Jamison, professor of psychiatry at Johns Hopkins University, concluded that among distinguished artists she investigated, the rate of affective disorders was 10-30 times more prevalent than in the general population. Nancy Andreasen, chair of psychiatry at the University of Iowa's Carver College of Medicine, studied 30 authors from the university's famous writers' workshop and discerned that artists, though prone to emotional disorders, do not have high rates of schizophrenia - but their families do. The suggestion is that some features associated with schizophrenia, which haven't developed into a psychosis, may confer some kind of creative originality. Hypomania (moderate levels of manic experience) can produce extraordinary periods of energy and concentration, followed by a plunge into depression. It may, in some people, confer benefits as well as deficits.